The ingredients to understand the two-level system  require a few concepts. The following sections will introduce the and develop these concepts and at the end, we will summarize what we have learned. First, we will examine the states of our system. Then, we will see how these states can indeed be thought of as vectors on the Bloch sphere and why this is particularly useful. Finally, we will see how we control the dynamics of the system, i.e. how the vectors are rotated around on the sphere as time passes. In this application, the two-level system consists of two internal electronic energy levels of an atom that can be controlled by a laser. These probabilities must add to 1! Any choice of a and b that satisfies this condition represents a physical state of our system. A fantastic feature of the two-level system is the ability to express the states as geometrical vectors on a sphere of radius 1, known as the Bloch sphere. 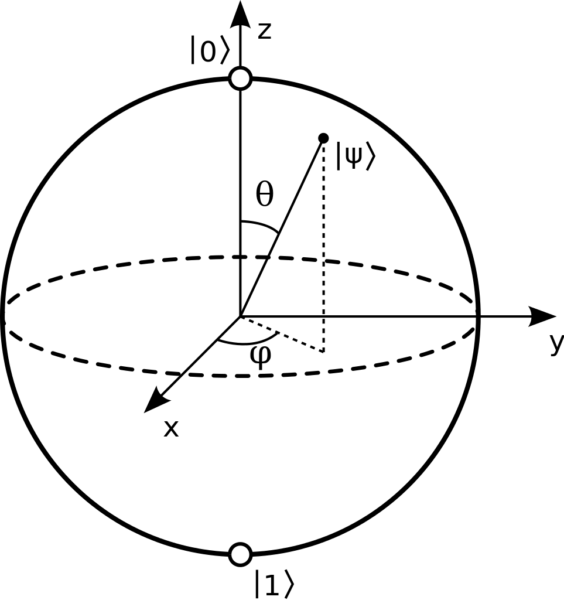 Every combination of the two angles now uniquely describe a vector of length 1 on the Bloch sphere. Neat! Is this consistent with our probability conditions? Yes, it is! When θ=0 the vector points directly ‘up’ and the system is in the ground state with probability 1. When θ=π the vector points directly ‘down’ and the system is in the excited state with probability 1. When the angle is anywhere in between, the system is in a superposition state with probabilities given by our earlier calculations. The more the vector points up (down) the larger is the probability of being in the ground state (excited state). Our states are vectors on a sphere with radius 1. This statement along with the interpretation of our ground state and excited state summarizes our entire discussion up until now. On the left-hand side of the SE, we have the derivative of the state with respect to time. That is nice because our goal is to examine how the system evolves as time goes on. We also have the complex unit ‘i’ on the left-hand side. Without getting too technical, this is necessary for quantum mechanics to exhibit wave-like nature (iIf it was not there, the Universe would be dead and decayed). where σx and σz are so-called Pauli spin matrices and is the so-called Rabi frequency and detuning respectively. It is only at this point where we have used anything related to our specific problem of controlling atoms with light! Loosely speaking, shows us how intense the light is and tells us how closely the wavelength of the light matches the energy difference between the two levels. Note that both quantities can both be negative and change in time. The final idea, that ties this section to the previous one, is that the Pauli spin matrices are so-called generators of rotations! σx (σz) is responsible for rotating our vector around the x-axis (z-axis), the size of () determines how fast the vector rotates, and the sign of ()determines if the rotation is clockwise or counterclockwise. States are represented as vectors on a sphere of radius 1. The angle made with the vector and the z-axis determines the probability of the ground state and the excited state. Time evolution corresponds to rotating the vectors around on the sphere depending on the size and the sign of and, which are physical characteristics of the laser and the atom.